We must ask this question, not in order to deligitimize the Arab people known as the Palestinians, but because their leaders are making baseless claims in order to delegitimize the Jews and the State of Israel. Christians also must examine these claims because they are made by Muslims to undermine or distort the Bible and to mobilise the church against God’s covenant people and covenant land. Sadly, many have failed to be discerning and have fallen into Christian Palestinianism. If the media and politicians took the trouble to consult history books instead of merely listening to what people are saying today, the present war of words over “the Middle east conflict” would be much more clear cut. Instead we are in the position where the most preposterous lies, told often enough and seriously enough, have become recognized as truth. The Children of Israel were given the task of casting out the wicked people from the land of Canaan. You can read the list of tribes in Genesis 10 v15, Exodus 3 v8, Exodus 3 v17, Exodus 13 v5, Exodus 23 v23, Exodus 34 v11, Deuteronomy 7 v1-4, …………. They were largely successful, but not entirely. The Philistines arrived from Crete, in the Aegean, around the same time as Israel and were long term enemies. They were eventually destroyed, presumably in the Assyrian invasion of the area. See Jeremiah 47 v4, Isaiah 14 v29, Jeremiah 47, Amos 1 v8, Zephaniah 2 v5. After the time of Jesus the Romans defeated Israel and scattered the Jews and renamed the land Palestina, after the ancient enemies of the Jews, in order to reinforce the defeat of the Jews. The land was laid waste over the centuries but continued to be home to small communities of Jews and Bedouin Arabs. For centuries, the land was not a nation but a neglected territory belonging to various empires, and nobody called himself a Palestinian. As the Zionists started living there, they were known as Palestinian Jews. The Arabs only started using the title, at the behest of Yasser Arafat, after their defeat in the war of 1967. When the Zionists started to return to the land* around the turn of the 19th to 20th centuries they were seen as a threat by the Arab communities and violent opposition was commenced, incited by the likes of Al Husseini, Mufti of Jerusalem. In spite of this and the various discouragements from the British (mandated by the League of Nations to bring the Jews back) the Jews started to restore the land and create businesses and jobs. At this time Arabs from various surrounding lands moved to Israel for work and a better life. Many came from Transjordan, meaning that many Palestinians are actually Jordanians. The wars of the 20th Century complicated the issues, as is always the case when war displaces people and borders change. *The Land, in this context, is the land known today as Israel. At the turn of the 19th to 20th centuries, the area of land that includes Israel was a backwater of the Turkish Ottoman Empire and there was no nation state there. The area was described as Palestine or the Levant. The only people who identified themselves as Palestinian were Jews who lived in the British Mandate of Palestine after the breaking up of the Ottoman empire. Interestingly, the New York Times identified the Jews as Palestinians in 1945. 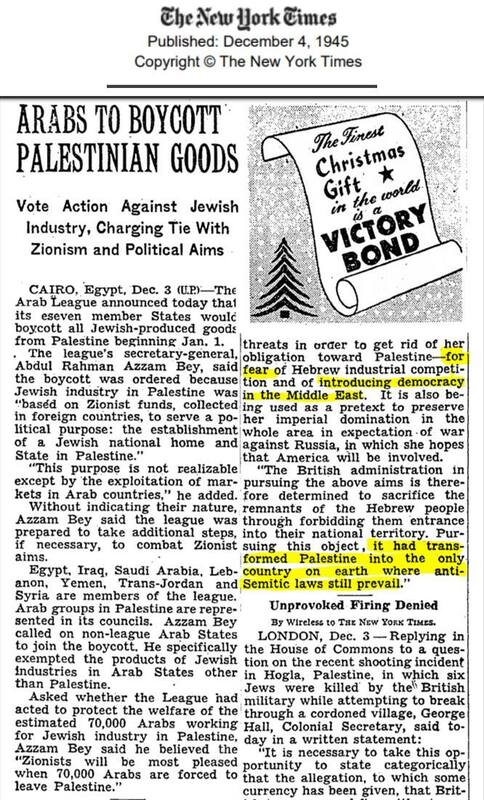 New York Times - December 4 1945 - Arabs boycott the Palestinians; that is, the Jews. It is also interesting to note that these Jews, being identified as Palestinians, were being boycotted by Arabs and their sympathisers before there was a Jewish state of Israel to boycott. Wildolive is indebted to Aviel Schneider and Israel Today magazine for most of the following information. Ibraham Abdullah Sar-sur , Arab Knesset member and leader of the southern branch of the Islamic Movement in Israel. Kamal Khatib alsoclaims that the king of Salem (Jerusalem) Melchizedek (Genesis 14 v18) was the high priest of the god of the Jebusittes, the ostensible forefathers of today’s Palestinians. Yasser Arafat , his successor Mahmoud Abbas and legislator Hanan Ashwari all claim(ed) that the Palestinians are descendents of the Canaanites and that Jesus was a Palestinian. Ahmad Abu Ziad and Khaled Dahamshe, Fatah members and residents of the old City of Jerusalem, regard themselves as descendents of the Philistines. Sheikh Salem al-Huzeil , leader of a Bedouin tribe in southern Israel claims that his tribe and possibly other tribes in the area have Jewish ancestry. He told local Jewish leaders that his ancestors were Jews who were forced to convert to Islam following the Muslim conquest of the Holy Land 1300 years ago. Many Bedouin in Israel maintain customs that are foreign to other Muslims but which bear a distinct resemblance to Judaism. Unidentified Palestinian Christians (for security reasons) say that Palestinian claims cannot match those of the Jews. Mordechai Kedar , a top Israeli expert on Islam. Gershon Nerel , Messianic Jewish historian, speaks of the Palestinian’s dangerous revision of history and calls this duplicity to reject the validity of the biblical promises regarding the land while using the biblical Jebusites and Canaanites to validate their claims for their ancestry. Tsvi Sadan , editor of the Hebrew language Messianic magazine Kivun remarked that this is spiritual warfare over the inheritance of the Holy Land. He believes that Israel needs a new public relations strategy. Israel explains its religious claim to the land through politics while the Palestinians explain their political claim to the land through religion. "The Palestinian people does not exist. The creation of a Palestinian state is only a means for continuing our struggle against the state of Israel for our Arab unity. In reality today there is no difference between Jordanians, Palestinians, Syrians and Lebanese. Only for political and tactical reasons do we speak today about the existence of a Palestinian people, since Arab national interests demand that we posit the existence of a distinct 'Palestinian people' to oppose Zionism. " "For tactical reasons, Jordan, which is a sovereign state with defined borders, cannot raise claims to Haifa and Jaffa. While as a Palestinian, I can undoubtedly demand Haifa, Jaffa, Beer-Sheva and Jerusalem. However, the moment we reclaim our right to all of Palestine, we will not wait even a minute to unite Palestine and Jordan." The Palestinian leadership, including Ahmed Shukar and Yasir Arafat, has openly admitted Palestinian "peoplehood" is a fraud; read this. Jordan is Palestine. Palestine is Jordan. King Abdullah said, in 1948. "Palestine and Jordan are one..."
King Hussein of Jordan said, on 26th November 1981, In an interview with the Arabic newspaper A-Nahar al-Arabia. 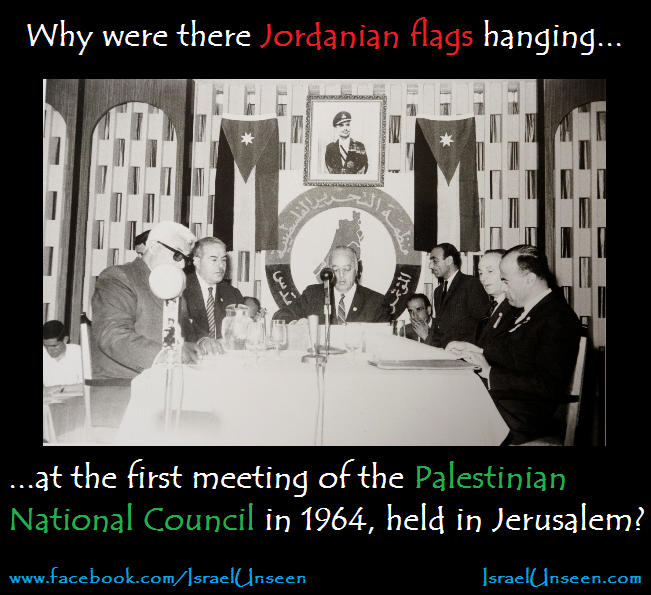 "The truth is that Jordan is Palestine and Palestine is Jordan,"
Prince Hassan of the Jordanian National Assembly was quoted as saying on February 2, 1970. "Palestine is Jordan and Jordan is Palestine; there is only one land, with one history and one and the same fate,"
Abdul Hamid Sharif, Prime Minister of Jordan declared, in 1980. "The Palestinians and Jordanians do not belong to different nationalities. They hold the same Jordanian passports, are Arabs and have the same Jordanian culture." "There should be a kind of linkage because Jordanians and Palestinians are considered by the PLO as one people,"
"Palestine has never existed - before or since - as an autonomous entity. It was ruled alternately by Rome, by Islamic and Christian crusaders, by the Ottoman Empire, and briefly by the British after World War I. The British agreed to restore at least part of the land to the Jewish people as their homeland. There was no language known as Palestinian. There was no distinct Palestinian culture. There has never been a Palestine governed by the Palestinians. Palestinians are Arabs, indistinguishable from Jordanians, Syrians, Lebanese, Iraqis, etc." * Approximately half of Jordan's prime ministers since 1950 have been Arab 'Palestinians'. * More than 2/3 of the Jordanian people are Arab 'Palestinians'. On April 24, 1950, Abdullah formally merged all of Arab-held Palestine with Transjordan and granted citizenship to all Arab residents and settlers (the vast majority of whom arrived the 1920s for economic reasons). The Hashemite Kingdom was no longer only across the river so the prefix "Trans" (meaning "across") was dropped, and henceforth, the land became known as Jordan. Wilders also called on the Dutch government to refer to Jordan as Palestine and move its embassy to Jerusalem. MEF backgrounders highlight select news-relevant research and analysis from Middle East Forum staff, fellows, and publications. Sign up to the MEF mailing list to stay abreast of our work. Israeli Prime Minister Benjamin Netanyahu caused a storm of controversy on October 20 2015 by quoting Hajj Amin al-Husseini, the infamous grand mufti of Jerusalem during the interwar years, as having told Adolf Hitler in 1941 to "burn" rather than deport the Jews of Europe, insinuating that this influenced the unfolding Nazi genocide. While the veracity of this quote is in question, few dispute that Husseini could well have said something to this effect given his genocidal hatred of Jews, penchant for blood-curdling rhetoric, and determination to prevent Jewish immigration to Palestine. However, opinions differ sharply, even among MEF staff and fellows, as to the degree of Hussein's influence, both in Nazi Germany and the Middle East. Wolfgang G. Schwanitz, coauthor of Nazis, Islamists, and the Making of the Modern Middle East (2014), argues that two components of this question are unmistakably clear. 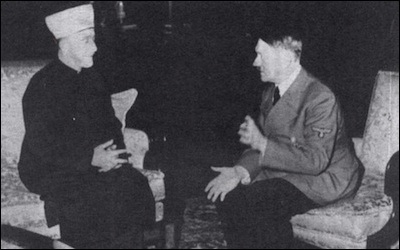 First, Husseini's over-arching goal prior to and during Hitler's reign, he notes, was that "whatever happens with Jews under Hitler's reign in Europe, they should not come to the Middle East." At the very least, the Germans understood that deportation as a solution to Europe's "Jewish Question" risked alienating their top protégé in the Arab world – a region they expected in 1941-42 to be invading soon. Second, Schwanitz notes that the historical record shows the mufti to be unquestionably the "foremost extra-European adviser in the process to destroy the Jews of Europe." Adolf Eichmann and his subordinates frequently briefed Husseini as the genocide unfolded, "as if to reassure him that Hitler had not changed his mind," he writes in a forthcoming article. In contrast, Jeffrey Herf, author of Nazi Propaganda for the Arab World (2010), contends that the Husseini's "importance in Nazi Berlin lay far more in assisting the Third Reich's Arabic language propaganda ... and in mobilizing Muslims in Eastern Europe to support the Nazi regime." Although these achievements surely facilitated Nazi atrocities, Hitler "made the decisions to implement the Final Solution and had communicated those decisions to key actors in the Nazi regime at the latest a month before his meeting with Husseini." Whatever his role in the Holocaust, MEF staff and fellows widely agree that Husseini was a critical ideological progenitor of Middle Eastern extremism today. The mufti was among the first to "exploit the draw of the Islamic holy places in Jerusalem to find international Muslim support" for the anti-Zionist cause, notes MEF President Daniel Pipes, a theme very much in evidence today among Palestinian Islamists. Moreover, Husseini "can be largely held responsible for the Middle East's endemic antisemitism," writes Daniel Pipes in a recent Washington Times op-ed, pointing to his postwar tutelage of Yasser Arafat and other rising Palestinian figures, as well the Muslim Brotherhood during his stay in Egypt after the Nazi defeat. As Boris Havel illustrates in a recent Middle East Quarterly article, Husseini's propaganda traced "alleged Jewish power and ambitions" in the here and now "to supposed Jewish activities at the time of Muhammad," a theological innovation that is today a staple of Islamist discourse. Because of Husseini, there remains an "inescapable and inextricable connection between Islamists ... and the Nazi movement" today, MEF Director Gregg Roman told Al-Jazeera English on October 22. In an early Middle East Quarterly article, famed Princeton University historian Bernard Lewis notes (without specific reference to Husseini) the "astonishing degree" to which "the ideas, the literature, even the crudest inventions of the Nazis and their predecessors have been internalized and Islamized" in the Middle East. At the same time, it is important not to overstate Husseini's influence. When the American Freedom Defense Initiative (AFDI) placed ads on Philadelphia buses displaying a photo of Husseini and Hitler with a caption reading "Adolf Hitler and his staunch ally, the leader of the Muslim world," Daniel Pipes cautioned that the "text is factually inaccurate," calling Husseini "a British appointee in the Mandate for Palestine, where Muslims constituted less than 1 percent of the total world Muslim population." Palestinians who are Jews in origin? There is evidence that many “Palestinians” who have lived in Israel since earlier times are actually descendants of Jews who converted to Islam rather than leave their homeland. There is evidence in family names, Jewish customs preserved, tradition and even DNA evidence. While a figure as high as 89.5% is incompatible with some of the factors detailed above, the implications of sections of Israel’s enemies actually being Jewish in origin and custom needs serious consideration. What if they realise their heritage and return to it? The above may not fit well with normal Christian eschatology but should prompt us to realize that God’s plans may involve factors we had not even dreamed of. There is a body of people whose presence and existence is being used as a weapon against Israel in the world opinion forum. But this case is invalid. Palestinian Refugees are unique in inheriting this status down through the generations instead of being settled and becoming citizens. Had the Arabs accepted the 1947 UN resolution, not a single Palestinian would have become a refugee and an independent Arab state would now exist beside Israel. See Jewish Virtual Library www.jewishvirtuallibrary.org/jsource/History/refugees for a deeper analysis. The Arabs from Israel who became refugees did so because they were told by Arab leaders to leave their homes until Israel was destroyed, at which time they could return and take over the property of the Jews. It did not happen this way and they were left in Arab lands that refused to help them but kept them as pawns. At the same time a greater number of Jews were thrown out of Arab nations, leaving their homes and assets behind. The new and impecunious state of Israel absorbed them all while the Arab states refused to help their brother Arabs. Some are describing what happened to the Arabs using all sorts of modern, negative terms such as ethnic cleansing, apartheid, racism etc but this type of population exchange has always been a feature of the aftermath of war. When the British sorted out the religious/racial mess in India by dividing the land into India (mostly Hindu) and Pakistan (Muslim), populations were exchanged and got on with building their lives in their new homeland. Only the Arab refugees have maintained their refugee status and even had a United Nations department set up to perpetuate their refugee status. See Honest Reporting on UNRWA - www.honestreporting.com from which the following is taken. UNRWA, it could also be argued, is a negative influence on prospects for peace. There have been reports of Hamas members and potential terrorists being on the UNRWA payroll along with the use of anti-Semitic and anti-Israel textbooks in UNRWA-sponsored schools. Davis also takes issue with the anti-Israel statements of UNRWA spokespeople. UNRWA's grant of refugee status to the children, grandchildren and great-grandchildren of the original Palestinian refugees according to the principle of patrilineal descent, with no limit on the generations that can obtain refugee status, has made it easy for host countries to flout their obligations under international law. According to Article 34 of the UN Convention Relating to the Status of Refugees, "The Contracting States shall as far as possible facilitate the assimilation and naturalisation of refugees," and must "make every effort to expedite naturalisation proceedings" – the opposite of what happened to the Palestinians in every Arab country in which they settled, save Jordan. In fact, the bulk of UNRWA's funding comes from western donors with only a small proportion from the Arab states. "Seven million Jews worry about the fate of Gilad Shalit, while 300 million Arabs couldn't care less what happens to hundreds of thousands of Palestinians," said Walid Taha, who lives in the Shatila camp in Beirut. And Just a reminder of a couple of inconvenient truths about Palestinian positions in the past.